BURLINGTON- In a place known as the Horse Capital of the World, the 4-H organization has long enjoyed a special relationship with the equine population. Nowhere is that more evident than in Boone County, Kentucky, home of the 2017 State Champion 4-H Elite Equestrian Drill Team. This group of 4-H members, along with local program leaders and a supportive parent-base are continuing a nearly three-decade tradition of drill team participation. In fact, some current participants represent a second generation in their respective families involved in the sport. Boone County Elite Equestrian Drill Team member Elise Curtis with a team horse name Tiger Lily. Pam Pickett, known as the Drill Master of the team, actually got the Boone County program started 29 years ago. It is so popular in Boone County that the team is actually comprised of two groups, similar to the traditional varsity and junior varsity model. Pickett said the younger, less experienced riders participate on the “Fillies” team while the more advanced riders are a part of the “Mares” team. During their routine, “Mares” team members carry an American flag as they compete while the “Fillies” concentrate more on learning the different maneuvers and managing their horses. Pickett said while there is a 24-person limit for the 4-H teams, she never turns away a student who wants to participate. Many of those coming to her have never ridden and are often quite shy about it. But after being a part of the program, which involves having six hours of 4-H classes related to horsemanship, they begin to get used to their horse, and for many it really changes them, she added. In order to create and continue such a program, a facility is needed to accommodate the horses and students as they go through their practices, which take place two or three times a week during their training and completion season. Susan Elslager and her Johnny Walker Stables farm, a boarding and dressage training facility, have served that purpose for many years. Senior team member from left: Flo Daspremont, Audrey Reed,and Hannah Wagner. The local 4-H leader, who named the farm after the first horse she ever owned, said she grew up being a member of 4-H and both her daughters were in the equestrian program. She added that while the students are learning so much about their horses and each other, their parents are also learning and pitching in to help, including the simplest things that go with being around horses such as scooping poop from the training arena. It takes a team to help the team and Elslager opened up her facility years ago to give these young people a chance to work with a horse perhaps for the first time. As they learned, through the 4-H program all about the caring for the animals, they also gained responsibility skills. Elslager, offering the use of her farm, is indicative of the support system the Boone County team enjoys. Pickett said the program benefits from great community support and with the successful year they had in 2017, which included riding in the Inaugural Parade in Washington, D.C., many more community members have discovered the team. The attention and support received to help get the students, coaches and horses to the nation’s capital was outstanding, she noted. 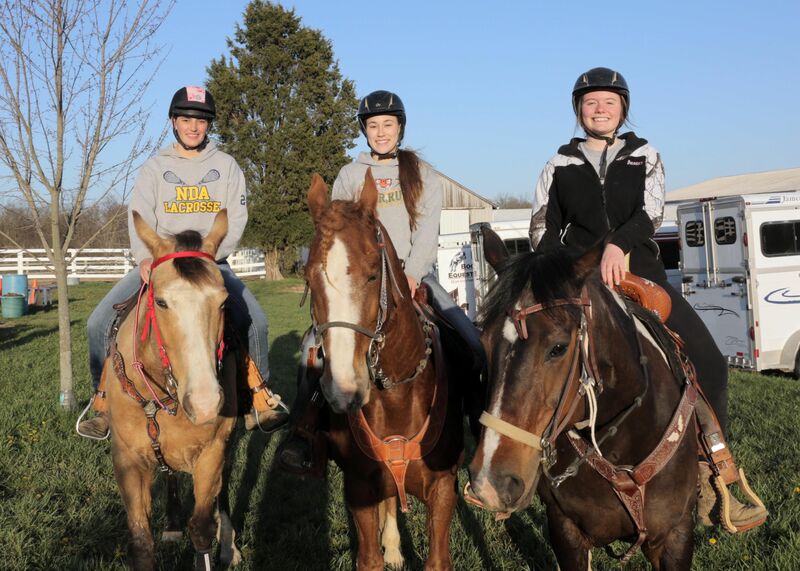 Like many of her students, Pickett also grew up with 4-H and she refers to her efforts with the drill team as, “paying it forward.” And that is something her older riders are learning. “To see the older members mentor the younger ones, my heart just swells because that’s what they are learning, to be leaders,” she said. The three seniors on this year’s team bring much experience to the program and have fulfilled that leadership role, according to Pickett. Audrey Reed, Flo Daspremont, and Hannah Wagner are spending their last season on the team but have all enjoyed being a part of it and have embraced becoming those leaders. Reed who has ridden for a total of 12 years, spent half that time as a drill team member. She said she feels like it’s part of her role as a senior to help those with less experience. “It feels awesome to give some of my knowledge to the younger riders and that’s what 4-H is all about,” she said. Wagner, who grew up around horses, has also spent six years with the team. She said leadership comes with being involved in 4-H.
4-H teaches us not only leadership but responsibility,” she said. Although it was her first year with the team, Daspremont has been involved in riding for a number of years, as well. She had heard about the program and wanted to be a part of it during her final high school year. “Even though it is my first year, I have found myself in a leadership role handing down what I know to the new riders,” she said. While senior leadership is critical to the success of this program, many of the young riders also bring quite a bit of experience with them. 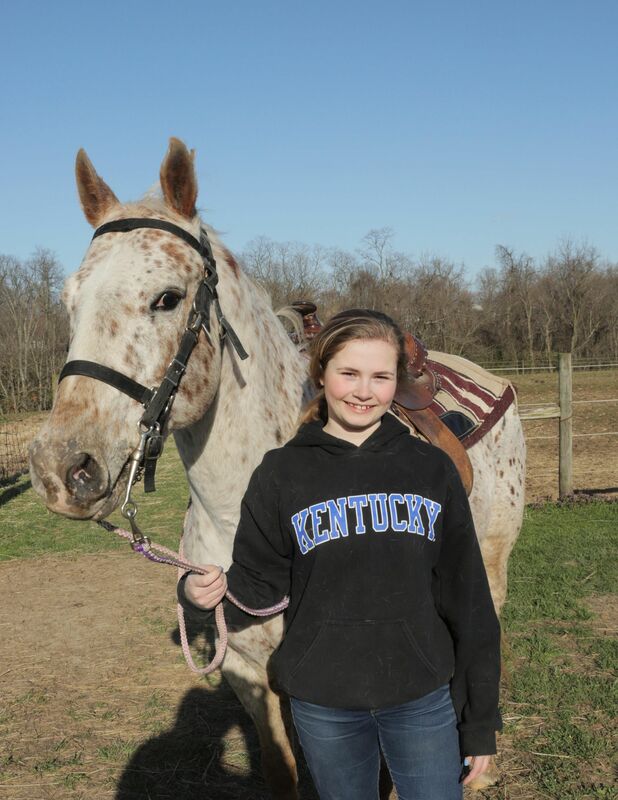 Emily Walden, an eighth-grade member, has grown up riding and when not practicing with the drill team, spends much of her free time riding and showing her Saddlebreds. She said she discovered the team by way of one of her horses. Walden was nine years old at the time but she began riding at the age of three. That experience has helped her contribute to this very talented team and she plans to continue through her high school years. “We can only participate on the team until we are 18 but I want to be involved with horses the rest of my life,” she said. Alyssa Mosmeier is another younger team member with a long history of riding, having grown up on a horse farm and participating in dressage. She said there is a lot of work that goes into being a part of the drill team but that it is a lot of fun. Mosmeier said the team, in addition to competitions, gets to ride in many parades, the most recent being the Pegasus Parade, which is held each year in Louisville as part of the Kentucky Derby festivities. As much of a role as all the “people” play when it comes to making this drill team work, the horses have their own stories to tell. There is no certain breed that is necessary to make a good drill team horse. In fact, there are several different breeds represented every time the Boone County 4-Hers take the arena. But perhaps what is most rewarding for these animals is the fact some are rescue horses. Pickett and Elslager decided early in the formation of the team to use these rescues for those members who needed a horse. In watching the team practice, it is evident the efforts everyone puts into this program; the riders, as they maneuver around the ring in precision movements; their parents, as they watch and encourage their children; the leaders, as they instruct and mentor these young people; and the horses as they enjoy a second chance in this Horse Capital of the World as part of the Boone County Elite Equestrian Drill Team.